Did you know your incompetent cleaning techniques might deface the glass surface of your windows? Glass is a fragile material and that’s what makes its cleaning one heck of a job. You simply cannot use any cleaning material or chemical to wipe down your glass windows; there are chances that you will end up leaving scratches or may crack the brittle see-through. This is where professional window cleaning services come into the scene. Custom Made Services houses a team of professionals that can handle all types of window cleaning tasks for all types of properties. We care to use specialized window cleaning equipment and chemicals that procure outstanding results. There’s a plus point of hiring window cleaning service: you will get ample time to relax and socialize with friends and family while the professionals get the job done in the desired manner. Sometimes, windows are positioned awkwardly at a certain height, where they are not easily accessible from outside for cleaning purposes. For such inconvenience, there’s no point blaming your architect; it was his job and he did it quite well. We at Custom Made Services reach out to those apparently inaccessible windows, using ladders and harness to make high-rise window cleaning as simple as it could be. We choose the most appropriate time and day for cleaning your windows. The ideal moment for cleaning windows is when the sun is not shining bright and winds are blowing at a slower pace. This enables water to stay longer on the glass surface than it would have otherwise. Hence, less water is consumed during the cleaning process. We employ a holistic approach when carrying out window cleaning for your premises. First of all, we vacuum them to clear the dirt and debris. Next, we remove the stains using mild yet effective cleaning solutions and finally we wipe down the windows using water and a squeegee. 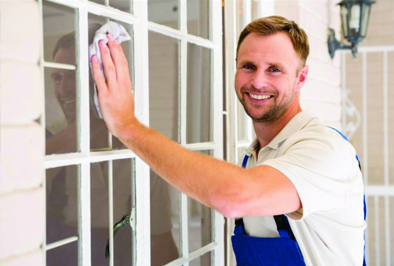 Call us today to avail yourself of the most dependable window cleaning services in town.